Ενας εξαιρετικος και μοναδικος συνδυασμος 6 φυτοστεροειδων με βαση την εκδυστερονη (ecdysterone) και του πατενταρισμενου συστατικου Testofen (150mg/cap), ειδικα σχεδιασμενο για αθλητες που θελουν δυνατο αναβολισμο, πολλη δυναμη και ισχυ, ΧΩΡΙΣ απαγορευμενες ουσιες. Περιεχει εκδυστερονη και 5 ακομη φυτοστεροειδη 150mg (ιση με 30 απο τις συνηθισμενες ταμπλετες στο εμποριο των 5mg εκδυστερονης) ωστε να λαμβανετε μολις 1 καψουλα την ημερα. 2 εκχυλισματα βοτανων που αποδιδουν 7 πανισχυρα φυτοστεροειδη με συνεργιστικη δραση μεταξυ τους, θα δωσουν το πλεονεκτημα του υψηλου αναβολισμου σε ολους τους αθλητες χωρις απαγορευμενες ουσιες ακομη και την ημερα του αγωνα τους. Προιον κατασκευασμενο με φαρμακευτικης ποιοτητας πρωτες υλες σε ειδικο φαρμακευτικο εργαστηριο. 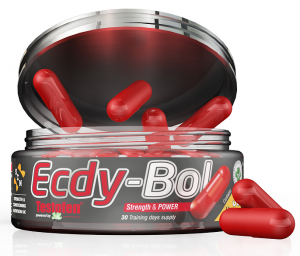 Ecdy-Boll contains 2 powerfull herb extracts, rhaponticum carthamoides extract and fenugreek (trigonella foenum graecum) extract. We only use the highest distilled form of these extracts, as we have included rhaponticum carthamoides 20:1 extract providing 95% ecdysterone and 10% other phytosteroids. We have combined this powerful herb extract with one of the world’s most powerful patented extracts, Testofen®, clinically proven to increase the endogenous production of testosterone. Our unique sport enhancing product for high level athletes, is produced in a high standard pharmaceutical certified lab with Bureau Veritas Iso9001 certification. Phytosteroids, are a group of phytochemicals (plant chemicals) also known as plant steroids, are naturally occuring steroids that are found in plants. Our 2 herb extrracts, provide totally 7 phytosteroids, that work sygergistically (work and act together). This magical herb, provides maybe the strongest natural substance ever known to maximize the strength and the power in sports, Ecdysterone. We use an extract that provides 95% ecdysterone, so every athlete is sure he takes the 100% of the maximum effective dosage that he needs, just in one (1) capsule. We DO NOT use ecdysterone from Spinach Extract or from Cyanotis Vaga herb, as they are not as well tolerated and effective as rhaponticum carthamoides. Note that the greater anabolic responce is achieved when using the extract of rhaponticum carthamoides and not seeds (whole or powdered) or plant. The maximum strength herb extract of 20:1 that we use, is the most effective one in the world market. So, always READ THE LABEL to be sure that you use the best for you, as you will find rhaponticum carthamoides in plant or seed powder, or 4:1, 8:1, 10:1 extracts which are not so effective as the 20:1 one. Several studies have shown that ecdysterone can increase libido, memory & learning, sleep quality, immune system function, EPO levels and also that provides an anti-fungal support. Testofen®, is a patented trigonella foenum graecum extract, that provides 50% fenuside (TM), a very strong plant substance that increases the anabolic ability, the testosterone endogenous production and the libido. Supplementing diets with products containing Testofen, and regular resistance exercise, can help men maintain healthy levels of free testosterone that are already within the normal range, which, in turn, supports multiple bodily functions. Citation: Wankhede S, Mohan V, Thakurdesai P, Beneficial effects of fenugreek glycoside supplementation in male subjects during resistance training: a randomized controlled pilot study, Journal of Sport and Health Science (2015), doi: 10.1016/j.jshs.2014.09.005. A study was conducted in Australia and aimed to assess the effectiveness of Testofen on symptoms of Andropause. This 12 week, single-site, double-blind, randomized, short-duration human clinical trial was conducted on 120 male subjects, aged 40-75, who reported having symptoms of Andropause (male menopause), and were otherwise considered to be healthy. Participants were given a clinically-validated questionnaire (AMS), which was comprised of seventeen questions in three sub-scales (Psychological, Somatic, and Sexual). This questionnaire helped gauge the level of severity of Andropause symptoms. In addition, this study also used the DISF-SR to measure the parameters. Testofen was shown to significantly reduce normal symptoms of Andropause in the active treatment group at weeks 6 & 12 in the total AMS score and all sub-domains (except psychological sub-score), compared to the placebo. Overall, Testofen was shown to effectively reduce the normal symptoms of Andropause and improve sexual health by significantly increasing arousal, sexual desire, sexual activity,and free and total testosterone levels. Citation: Rao, Amanda, et al., Testofen, a specialised Trigonella foenum-graecum seed extract reduces age-related symptoms of androgen decrease, increases testosterone levels and improves sexual function in healthy aging males in a double-blind randomised clinical study (2016). During a specialized research, muscle biopsies revealed that combining Trigonella foenum-graecum seed extract with glucose, results to a 63% more glycogen resynthesis than using the same amount of glucose alone. It was also noted that when a post workout glucose drink provided the insulin memetic properties of Trigonella foenum-graecum seed extract increased the amino acid transport into muscles, giving a great recovery and anabolic result. Details: Each tube contains 30 Vcaps®, each providing 150mg of Testofen® and 150mg of rhaponticum carthamoides 20:1 extract.